Air Mobility Command (AMC) is a Major Command (MAJCOM) of the U.S. Air Force. It is headquartered at Scott Air Force Base, Illinois, east of St. Louis, Missouri. "AMC’s mission is to provide air mobility: Right Effects, Right Place, Right Time." Scott Air Force Base, Illinois, U.S.
"We answer the call of others... so that they may prevail." CMSgt Larry C. Williams, Jr.
Air Mobility Command was established on June 1, 1992, and was formed from elements of the inactivated Military Airlift Command (MAC) and Strategic Air Command (SAC). AMC melded MAC's worldwide airlift system of primarily C-5 Galaxy, C-141 Starlifter and C-130 Hercules airlift aircraft with SAC's tanker force of KC-135 Stratotanker and KC-10 Extender aerial refueling aircraft, the latter aircraft having been freed from their strategic nuclear strike commitment to SAC's B-52 Stratofortress and B-1 Lancer bomber fleet by the end of the Cold War and the dissolution of the Soviet Union. Air Mobility Command's mission is to provide global air mobility. The command also plays a crucial role in providing humanitarian support at home and around the world. AMC Airmen – active duty, Air National Guard, and Air Force Reserve, augmented by the civilian airliners and flight crews of the Civil Reserve Air Fleet (CRAF) – provide airlift and aerial refueling for all of the United States' armed forces. Many special duty and operational support aircraft (OSA) and stateside aeromedical evacuation missions are also assigned to AMC. U.S. forces must be able to provide a rapid, tailored response with a capability to intervene against a well-equipped foe, hit hard and terminate quickly. Rapid global mobility lies at the heart of U.S. strategy in this environment. Without the capability to project forces, there is no conventional deterrent. As the number of U.S. forces stationed overseas continue to decline, global interests remain, making the capabilities AMC can provide even more in demand. Air Mobility Command also has the mission of establishing bare air bases in contingencies. To accomplish this mission, AMC established two Contingency Response Wings, and operates the Eagle Flag exercise. In addition to its status as a MAJCOM of the Air Force, AMC is also the Air Force component command of the United States Transportation Command (USTRANSCOM). It provides airlift, special missions, aerial refueling, and aeromedical evacuation for the United States armed forces. It also provides alert aerial refueling aircraft to the United States Strategic Command, and is a provider of theater airlift, aerial refueling, and aeromedical evacuation forces to the regional Unified Combatant Commands. AMC also operates VIP flights such as Air Force One, Air Force Two, and other Special Assignment Airlift Missions (SAAM). Finally, AMC acts as the single manager, on behalf of United States Transportation Command (USTRANSCOM), for Military Space Available Travel. Principal aircraft assets of the command include: C-17 Globemaster III, C-5 Galaxy, C-130 Hercules, KC-135 Stratotanker, KC-10 Extender, C-40 Clipper, C-37 Gulfstream V, and the C-21 Learjet. As of 2015, the command is also preparing for the addition of the KC-46 Pegasus. Additional long-range airlift aircraft are available during national emergencies through the Civil Reserve Air Fleet (CRAF), a fleet of commercial aircraft committed to support the transportation of military forces and material in times of crisis. Additional aircraft in support of high-profile VIP airlift include: VC-25, C-32, C-20G, C-20H, and the C-38. In addition to the active duty AMC units, numerous Air Force Reserve Command (AFRC) and Air National Guard (ANG) units equipped with C-5, C-17, C-21, C-38, C-40, C-130, LC-130, WC-130, KC-10 and KC-135 aircraft are "operationally gained" by AMC. These units train and exercise frequently and routinely provide augmentative operational support to AMC's active duty forces. AFRC units, when mobilized to active duty, and ANG units, when mobilized to federal service and active duty, may be deployed overseas as part of AMC in Air Expeditionary Groups and Wings as directed by HQ AMC. ANG air mobility units currently operate the C-21, C-17, C-38, C-40, C-130, LC-130 and KC-135, but are not assigned to a particular Numbered Air Force in the Air National Guard. Instead, they report to AMC via the National Guard Bureau (NGB). NOTE: Composite wing with F-16 fighter & C-38/C-40 airlift aircraft. F-16 assets gained by ACC; C-38/C-40 assets gained by AMC. NOTE: Composite wing with MQ-1 RPA and C-21 airlift aircraft. MQ-1 assets gained by ACC; C-21 assets gained by AMC. NOTE: Composite wing with A-10 fighter and KC-135 aerial refueling aircraft. A-10 assets gained by ACC; KC-135 assets gained by AMC. NOTE: Composite wing with F-16 fighter and C-21 airlift aircraft. F-16 assets gained by ACC; C-21 assets gained by AMC. AMC has undergone considerable change since its establishment. Focusing on the core mission of strategic air mobility, the command divested itself of infrastructure and forces not directly related to Global Reach. The Air Rescue Service, intratheater aeromedical airlift forces based overseas and much of the operational support airlift fleet were transferred to other commands. However, all KC-10 Extender and most KC-135 Stratotanker air refueling aircraft initially assigned to Air Combat Command following the disestablishment of Strategic Air Command (SAC) were transferred to AMC, along with Grand Forks AFB, McConnell AFB and Fairchild AFB. As a result of the Global War on Terrorism, on October 1, 2003, AMC underwent a major restructuring, bringing a war fighting role to its numbered air force. AMC reactivated Eighteenth Air Force (18 AF) and established it as its main war fighting force. As subordinate components of 18 AF, AMC redesignated its two former numbered air forces as Expeditionary Mobility Task Forces (EMTF). Fifteenth Air Force was redesignated as the 15th Expeditionary Mobility Task Force (15 EMTF), headquartered at Travis AFB, and Twenty-First Air Force was redesignated as the 21st Expeditionary Mobility Task Force (21 EMTF), headquartered at McGuire AFB. AMC's ability to provide global reach is tested daily. From providing fuel, supplies and aeromedical support to troops on the frontline of the Global War on Terrorism, to providing humanitarian supplies to hurricane, flood, and earthquake victims both at home and abroad, AMC has been engaged in almost nonstop operations since its inception. Command tankers and airlifters have supported peacekeeping and humanitarian efforts in Afghanistan, Bosnia, Iraq, Cambodia, Somalia, Rwanda and Haiti, and continue to play a vital role in the ongoing Global War on Terrorism. The USAF believes that air mobility is a national asset of growing importance for responding to emergencies and protecting national interests around the globe. AMC accepted its first C-17 Globemaster III at Charleston AFB, South Carolina, on June 14, 1993, and declared initial operational capability on January 17, 1995. AMC's second C-17 wing was established at McChord AFB, Washington, in July 1999. The versatile C-17, America's future core military airlifter, is a key player in the Air Force's post-Cold War strategy of "global reach, global power". The C-17 replaced the C-141 Starlifter fleet inherited from Military Airlift Command (MAC). C-141s were retired as C-17s were accepted into the inventory. First seeing operational service in 1965 under the Military Air Transport Service (MATS), the last Starlifters were retired in the early 2000s. By 2004, the C-141 left AMC service with active duty USAF units, being confined to Air Force Reserve and Air National Guard units for the remainder of its operational service life. In 2004, 2005, and 2006, the C-141s assigned to the 445 AW participated in missions to Iraq and Afghanistan, mostly for the medical evacuation of wounded service members. The last eight C-141s were officially retired in 2006. The C-5 Galaxy airlifter, also inherited from MAC, is being modernized and upgraded into the C-5M Super Galaxy model. It is planned to modernize all C-5Bs and C-5Cs and many of the C-5As to the C-5M standard. The first C-5M conversion was completed on May 16, 2006, and performed its first flight on June 19, 2006. It is estimated that the modifications will extend the service life of the C-5 to about 2040. Most legacy models of the C-130 Hercules (e.g., C-130E, C-130H, C-130H2) in AMC, AFRC and ANG units will eventually be replaced by the C-130J Super Hercules. The C-130 family has the longest continuous production run of any military aircraft in history and has served in every branch of the U.S. armed forces other than the U.S. Army. During more than 50 years of service, the C-130 has participated in military, civilian and humanitarian aid operations. It is likely that future improvements to the C-130 will mean the design will be in service into the foreseeable future. The upgrades of the inherited Strategic Air Command KC-135 Stratotanker to E, R, RT and T models have extended their lifetimes to 36,000 (E) and 39,000 flying hours (R, RT and T), respectively. The last KC-135E was retired in 2009 and all remaining operational USAF KC-135 aircraft are of the KC-135R, KC-135RT or KC-135T series. Acquired by SAC in the late 1950s, according to the Air Force, only a few KC-135s would reach these limits before 2040; but at that time, some of the aircraft would be about 80 years old. The Air Force estimates that their current fleet of KC-135s have between 12,000 and 14,000 flying hours on them...only 33 percent of the lifetime flying hour limit...and none will meet the limit until 2040. Therefore, the USAF has decided to replace the KC-135 fleet. However, since there were originally over 500 KC-135s with the since-retired KC-135E included, these aircraft will be replaced gradually, with the first batch of about 100 aircraft to be replaced in the current buy. The effort to replace the KC-135 has been marked by intense controversy. The 59 KC-10 Extender tankers, originally acquired in the 1980s by SAC, have been operated largely in the refueling of large number of fighter aircraft on ferry flights, the refueling of other transport aircraft, or as supplemental airlift aircraft for palletized cargo, augmenting the C-5 and C-17 fleet. Conversely, the KC-135 fleet has operated largely in the in-theater role. In an attempt to modernize the platform, the USAF has awarded Boeing a US$216 million contract to upgrade its fleet of 59 aircraft with new Communication, navigation and surveillance and air traffic management system to operate into the 2020s. The direct successor to the USAF Military Airlift Command, the emblem of Air Mobility Command retained the historic emblem of not only the Military Airlift Command, but also the Military Air Transport Service (MATS), established in 1948 as the first Department of Defense Unified Command. The heritage of Air Mobility Command also includes the air refueling heritage inherited from the historic Strategic Air Command. 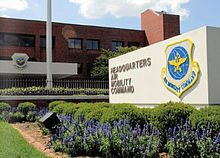 Defense Courier Service, October 15, 1998 – October 1, 2004. 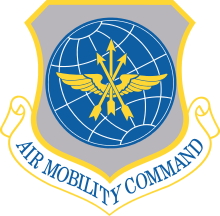 ^ a b c d "Air Mobility Command". af.mil. Archived from the original on 22 October 2017. Retrieved 29 April 2018. ^ "Air Mobility Command". af.mil. Archived from the original on 13 December 2017. Retrieved 29 April 2018. ^ a b c d e f "Air Mobility Command Fact Sheet". af.mil. Archived from the original on 15 September 2008. Retrieved 29 April 2018. ^ "Air Mobility Command Units". U.S. Air Force. Archived from the original on 28 October 2012. Retrieved 19 December 2012. ^ "Air Force Historical Research Agency". www.afhra.af.mil. Archived from the original on 17 December 2014. Retrieved 29 April 2018. ^ Dreyer, MSG Kristine. "AMC consolidates with MAC". Air Mobility Command Public Affairs. Archived from the original on 9 October 2016. Retrieved 7 October 2016.